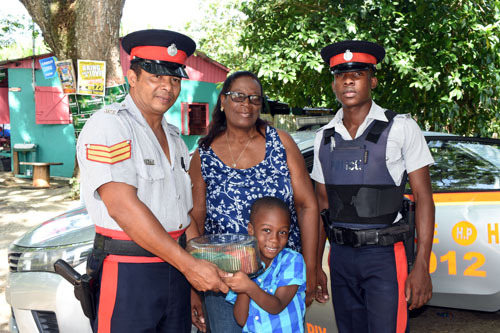 Recently, five-year-old Alrique Grant, who attends the Hanover Pre- and Preparatory School and whose ambition is to become a policeman, in an act of kindness, presented a cake and other refreshments to the security forces participating in the State of Public Emergency manning the border of St. James and Hanover. According to Alrique’s grandmother, Donna Archer-Ellis, retired teacher at Rusea’s High School, the idea came about as a result of her frequent visits to Montego Bay, during which Alrique travels with her. During one of their visits to the second city, Alrique quipped, “Grandma, they are doing a great job catching the bad guys. They must need a lot of fluid working in the hot sun”. He insisted on speaking to the officers at which time he asked if he could offer refreshments. The request was discussed with the officers’ superior and was given the green light. So on Friday, June 1, 2018, Alrique, with the refreshments garnered from the funds from his ‘piggy bank’ and assisted by his grandmother, visited the check-point and presented a cake, sandwiches, water and drinks.